Bournemouth guaranteed the highest league finish in their 118-year history by beating Burnley at Vitality Stadium. Former Burnley player Junior Stanislas scored the opener when he collected a long pass from Lewis Cook on his chest, sprinted clear of the away defence and calmly slotted in from 18 yards. Sam Vokes headed in a late equaliser for Burnley, but Josh King restored the hosts' lead two minutes later when he converted Ryan Fraser's low cross. The victory takes Bournemouth up to 10th and ensures they will conclude the campaign higher than last year's 16th-placed finish. Burnley remain 14th, six points above 18th-placed Hull, who have two games remaining. However, Sean Dyche's side's far superior goal difference means they will be playing in the Premier League next season. King's 16th league goal of the season gave the hosts a deserved victory, after Vokes had pulled Burnley level with only their third shot on target. 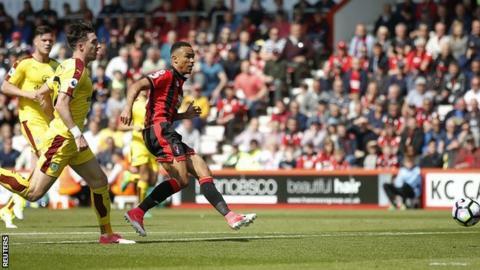 It means Bournemouth have won three of their past four matches, and a win at 2015-16 champions Leicester on the final day of the season could see the Cherries finish in the top half. "It would mean everything to be in the top half of the Premier League and it didn't seem realistic a few years ago," said manager Eddie Howe. "But we are here on merit and we have one game left to finish the job." It would be another sign of the remarkable progress they have made since Howe first became manager in 2008-09, at a time when the club were bottom of the fourth tier of English football and facing relegation from the Football League. Bournemouth, who had been given a 17-point penalty for being in administration, won their last three league games that season and avoided dropping into the fifth tier, before they moved up the divisions with three promotions in six seasons. Now they can regard themselves as an established Premier League club. Burnley have done enough to ensure Premier League football, but they desperately need to improve their away record if they are to avoid a relegation battle next term. They have only won one league game away from Turf Moor in 2016-17 and Vokes' goal was only the 13th they have scored on their travels. Burnley struggled to test Bournemouth goalkeeper Artur Boruc, with midfielder Scott Arfield having their best two efforts apart from the goal when he dragged a shot wide in the first half and curled an effort just off target in the second. Vokes' header, which saw him flick the ball in from 12 yards after an excellent right-wing cross by Johann Berg Gudmundsson, gave the Clarets hope of getting a rare away point, but King ensured it would be another tough day for Burnley's away support. Bournemouth boss Eddie Howe said: "It was a really good day for us. We're safe and it was asked if our standards would drop but we didn't. "Our goals were executed really well. We can shake off the odd knock and setback and we have won many points after going behind. "Josh King has been excellent. Every team needs a goalscorer and someone to lead the line, there is more to come from him too. "Will we lose him in the summer? I don't think so. We love working with him, hopefully he feels the same. We need to keep our best players and we will do everything in our power to do that." Bournemouth forward Josh King said: "I set myself a target of 15 goals at the start of the season. I have been building my confidence. Once you start scoring, it builds. "This is my first season where I have scored like this. Next year I need to prove myself and do it again before you can talk about me with Harry Kane and Romelu Lukaku. "I can't wait for next season to start. I've enjoyed it here from day one. Being noticed by other clubs is positive but my focus is 100% here." Burnley boss Sean Dyche said: "We gave away two really soft goals. We have had some big results lately and we looked flat today. Maybe it was one game too many. "Josh King was the difference I thought. He has been on fire and he played well again today. Match ends, Bournemouth 2, Burnley 1. Second Half ends, Bournemouth 2, Burnley 1. Robbie Brady (Burnley) is shown the yellow card. Robbie Brady (Burnley) has gone down, but that's a dive. Goal! Bournemouth 2, Burnley 1. Joshua King (Bournemouth) left footed shot from the left side of the six yard box to the centre of the goal. Assisted by Ryan Fraser. Offside, Burnley. James Tarkowski tries a through ball, but Andre Gray is caught offside. Goal! Bournemouth 1, Burnley 1. Sam Vokes (Burnley) header from the centre of the box to the bottom left corner. Assisted by Johann Berg Gudmundsson with a cross. Attempt missed. Lewis Cook (Bournemouth) right footed shot from outside the box is too high. Attempt blocked. Joshua King (Bournemouth) right footed shot from the centre of the box is blocked. Assisted by Dan Gosling. Attempt missed. Sam Vokes (Burnley) header from the centre of the box is too high. Assisted by Robbie Brady with a cross following a corner. Corner, Burnley. Conceded by Steve Cook. Offside, Bournemouth. Junior Stanislas tries a through ball, but Ryan Fraser is caught offside. Corner, Bournemouth. Conceded by Matthew Lowton. Attempt blocked. Marc Pugh (Bournemouth) right footed shot from the left side of the box is blocked. Assisted by Charlie Daniels. Attempt blocked. Harry Arter (Bournemouth) right footed shot from outside the box is blocked. Assisted by Junior Stanislas. Corner, Bournemouth. Conceded by Robbie Brady. Corner, Bournemouth. Conceded by Stephen Ward. Attempt saved. Lewis Cook (Bournemouth) right footed shot from outside the box is saved in the centre of the goal. Assisted by Marc Pugh. Attempt blocked. Joshua King (Bournemouth) right footed shot from the left side of the box is blocked. Assisted by Harry Arter. Attempt missed. Junior Stanislas (Bournemouth) left footed shot from the centre of the box is too high. Assisted by Joshua King. Substitution, Bournemouth. Ryan Fraser replaces Lys Mousset because of an injury. Delay in match Lys Mousset (Bournemouth) because of an injury. Attempt missed. Joshua King (Bournemouth) right footed shot from the left side of the box is high and wide to the right. Assisted by Marc Pugh.